Biosynth’s new product AquaSpark™ beta-D-galactoside is the first commercially available single-compound luminogenic substrate for highly sensitive lacZ reporter gene assays and other analytical methods based on the detection of beta-galactosidase activity in vitro. Developed by Biosynth in cooperation with Professor Doron Shabat’s Ramot group at Tel Aviv University, AquaSpark™ probes work as single agents and do not require luciferase or luminescence enhancing polymers or other additives. They show higher efficiency and sensitivity than currently existing dioxetane probes and are designed to work under physiological conditions. Biosynth AquaSpark™ beta-D-galactoside combines excellent usability and high sensitivity with the top-notch signal of AquaSpark™ for improved lacZ expression control. The lacZ gene from Escherichia coli, encoding the enzyme beta-galactosidase (beta-Gal), is widely used as a reporter gene in many areas of the life sciences. Traditionally, the enzyme activity is tested using the X-Gal or ONPG chromogenic substrates. However, Biosynth’s new AquaSpark™ beta-D-galactoside chemiluminogenic substrate provides a faster and more efficient testing process using chemiluminescent probes that require no additives and work in vitro. The testing process is simple, adding beta-galactosidase at concentrations 22 U/L or 4U/L to the AquaSpark™ substrate reaction. Maximal light levels are reached only three minutes after addition of the substrate to the enzyme solution and high light emission continues for 30 minutes. At lower enzyme concentrations typically found in genetically modified cells, the light signal can keep on glowing at a high levels for several hours. Because AquaSpark™ shows unprecedented signal-to-noise ratio, the beta-D-galactoside test emits an unmistakeable green luminescence signal after the activation by beta-galactosidase. The light intensity is amongst the highest in all bio-tests available. 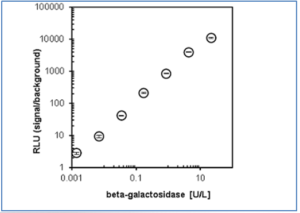 Even more important, AquaSpark™ chemiluminescence-based assays produce extremly low background noise with beta-D-galactoside experiments producing the highest signal-to-noise (S/N) ratio found at all tested enzyme concentrations. Standard deviation was the lowest at the enzyme concentration 0.8 U/L (±1.6%) and highest at 22 U/L (±4.7%). The new AquaSpark™ beta-D-galactoside takes advantage of the highly luminescent AquaSpark™ technology. 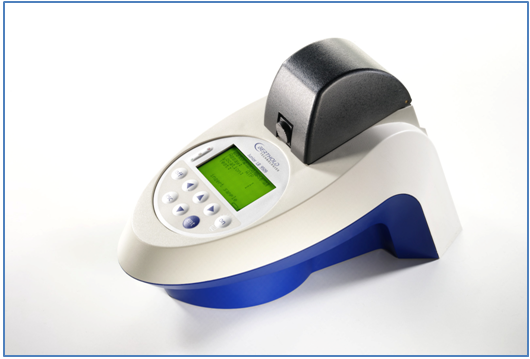 The strong signals of this system can be detected with every luminometer or plate reader that is equipped with a luminescence detector. 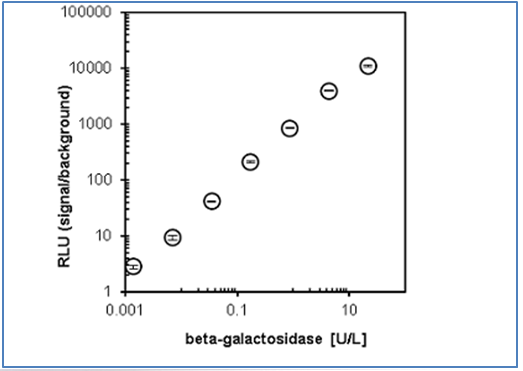 To detect the very lowest beta-galactosidase activity, the most sensitive instruments will of course give the best results. The Biosynth lab has conducted tests using two Berthold instruments, the Junior portable tube luminometer and the Centro microplate luminometer. Both instruments performed extremely well and can be highly recommended. Biosynth provides AquaSpark™ beta-D-galactoside (Catalog number: A-8169_P00) as a 10 mM stock solution in dimethyl sulfoxide (DMSO) for convenience and improved storage stability. AquaSpark™ beta-D-galactoside is typically used at 10 – 50 µM final concentration. Application of high performance chemiluminescent AquaSpark™ probes to achieve rapid and accurate identification of microorganisms, combining simplicity, sensitivity and fast response is described in Biosynth’s latest scientific product minireview (See Resources). For more technical information, to download the product information sheet and to buy online please visit Biosynth’s product web page (See Resources). Click on AquaSpark™ beta-D-Galactosidase chemiluminescence detection for more information. Click on AquaSpark™ beta-D-galactosidase, 10 mM in DMSO (A-8169_P00) to see product details . Click on Biosynth Microbiology Mini-Review to download background information. Berhold’s Junior LB 9509 (Copyright © 2018 Berthold Technologies. Used under permission).